100 ft L X 20 ft W. 9 ft depth, direct access to intercostal. 50 and 100 amp service. Free amenities included in the 5 month lease is: pump out at dock, potable water, fast wireless internet, swimming pool, parking in an exclusive guarded, gated community of Jonathan's Landing in Jupiter, Fl, which contains three championship 18 hole golf courses, miles of wide paths for walking, biking of golf carting. Lakes for canoeing and kayaking. Great Hurricane Hole! 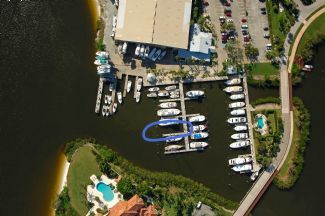 Marina is monitored by boater internet accessible video surveillance security camera system. Electric not included and will be billed the following month of usage at Florida Power and Light regular fees. First month and one month security required. Monthly Rate: $1,600 Mostly listings charge by "Flat Rate" per month.